The purpose of simple staining is to elucidate the morphology and arrangements of bacterial cells in milk. The commonly used basic stains are Methelene Blue, Crystal Violet, and Carbol Fuchsin. Chicken eggs were used for preparation of cell culture at 11,12, or 13 days of incubation. The disinfected egg’s air-sac region were cut and the embryo was removed from the shell. The embryo’s fibroblast region was processed with trypsinization. Hela cells can be grown to the appropriate density usually 70% in a humidified chamber at 37°C. HeLa cells in many labs are cultured in 75 cm2 flasks (or medium flasks). HeLa cells are grown in Dulbecco's Modified Eagle Medium with10% fetal bovine serum (FCS) and 1% MEM non-essential amino acids with penicillin-streptomycin at 1% is added to the culture media. The MTT assay is a colorimetric assay for assessing cell viability. NAD(P)H-dependent cellular oxidoreductase enzymes may, under defined conditions, reflect the number of viable cells present. These enzymes are capable of reducing the tetrazolium dye MTT 3-(4,5-dimethylthiazol- 2-yl)-2,5-diphenyltetrazolium bromide to its insoluble formazan, which has a purple colort. Tetrazolium dye assays can also be used to measure cytotoxicity (loss of viable cells) or cytostatic activity (shift from proliferation to quiescence) of potential medicinal agents and toxic materials. MTT assays are usually done in the dark since the MTT reagent is sensitive to light. Plant tissue culture is a collection of techniques used to maintain or grow plant cells, tissues or organs under sterile conditions on a nutrientn culture medium of known composition. Plant tissue culture is widely used to produce clones of a plant in a method known as micropropagation. Bacterial growth is the asexual reproduction, or cell division, of a bacterium into two daughter cells, in a process called binary fission. Providingno mutational event occurs the resulting daughter cells are genetically identical to the original cell. Hence, "local doubling" of the bacterialpopulation occurs. Both daughter cells from the division do not necessarily survive. However, if the number surviving exceeds unity on average, the bacterial population undergoes exponential growth. The measurement of an exponential bacterial growth curve in batch culture was traditionally a part of the training of all microbiologists; the basic means requires bacterial enumeration (cell counting) by direct and individual can estimate by calorimetric method. The effect to which salt concentration causes changes in bacterial growth depends on the osmotic balance required for such growth. Some bacteria require an astonishingly high level of salt to begin growth, whereas other bacteria would be immediately killed in high levels of salt. After the incubation, the presence or absence of the starch in the inoculated medium determines the ability of microorganisms to excretehydrolytic extra cellular enzymes capable of degrading the starch. The detection based on the hydrolytic activity of the organism, starch in the presence of iodine will impart a blue-black colour to the medium, indicating the absence of starch split by the enzymes and represent a negative reaction. If the starch has been hydrolyzed a clear zone of hydrolysis will surround the growth of the organism, representing a positive reaction. 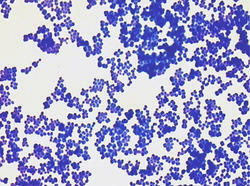 Yeasts are unicellular eukaryotes ranging from 8-15μm in width. They can be isolated from many sources such as curd and fruit juices etc., using suitable media like sabouraud dextrose agar, yeast malt agar etc. One of the industrially important strains of the yeast is Saccharomyces cerevisiae which is used in the production of alcohol, bakery items, food stuffs, animal feed and biochemicals. Great variability and type organism present in soil, it is impossible to isolate all microorganisms by single method. Therefore it is necessaryto use different media for growth of organisms. To support the growth of fungi different media (for instance: Sabouraud Dextrose Agar- SDA) are employed to isolate different kind of moulds from the soil samples. The fungal colonies are obtained from the soil sample after 3-4 days of incubation. Genera of the isolated colonies can be identified by lactophenol cotton blue staining. Five 50 ml samples of LB broth were buffered with acetic acid at pH 4 and 5, with MES at pH 6 and with HEPES at pH 7 and 8. Each sample of medium was transferred to a 250 ml flask and 0.5 ml of a saturated overnight ulture of E. coli was added to each flask. A sample was taken from each flask at times 0, 0.5, 1, 2, 3, and 4 hours. The amount of bacteria in each sample was measured using a spectrophotometer at 595nm. The OD(595nm) and time data were plotted to show growth curves at each pH tested. Determination of apoptosis By Staining Dye is primary method. Two types of dyes are used to study apoptosis are Hematoxylin Staining and Giemsa Staining. Bacteria of genus Rhizobium are fast growing Gram-negative rods that are normally involved in nitrogen fixation for the atmosphere. Rhizobia are commonly found in the root nodules of legumes;Yeast mannitol agar (YMA) has been recommended for the isolation of Rhizobium, so we used this media for our protocol. YMA contains yeast extract, which provides the bacteria with a nitrogen source, a necessary element for natural Rhizobium function. YMA also contains mannitol, a major one of the many carbohydrates that Rhizobium can utilize for metabolism.On the majority of the plates, white, mucilaginous, raised, semi-translucent colonies confirms the result for Rhizobium. This fits the Bergey's manual description of genus Rhizobium as forming "copious extracellular polysaccharide slime." Antibiotic sensitivity is the susceptibility of bacteria to antibiotics. Antibiotic susceptibility testing (AST) is usually carried out to determine which antibiotic will be most successful in treating a bacterial infection in vivo. Testing for antibiotic sensitivity is often done by the Kirby-Bauer method. Small wafers containing antibiotics are placed onto a plate upon which bacteria are growing. If the bacteria are sensitive to the antibiotic, a clear ring, or zone of inhibition, is seen around the wafer indicating poor growth. color of colony and the pure cultures of the bacterial isolates were subjected to various morphological and biochemical characterization tests to determine the identity of the bacteria and identification done by gram staining method. A sample of organisms from soil or some other source is diluted in water, then spread onto Petri dishes containing agar gel rich in the nutrients the bacteria will need to grow. Scientists select plates that have a large number of colonies, then look for microorganisms that have inhibited the growth of other microorganisms in their vicinity. These microbes are possibly secreting some kind of compound that is killing or inhibiting their neighbors. The isolation of antibiotic and identification of microbes by this method is known as crowded plate technique. 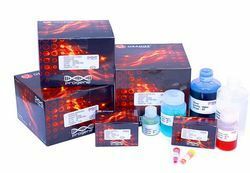 Looking for BIO TECH Teaching Kits ?